PILOT CLUB of TITUSVILLE, Inc. Since 1957, the Pilot Club of Titusville has supported the local community, upholding the Pilot tradition of "Friendship and Service." Pilot International exists to assist those in Pilot communities who are affected by brain-related illnesses including Alzheimer's disease, traumatic brain injuries, post-traumatic stress disorders (PTSD), schizophrenia, depression, autism and similar disorders. EDUCATION - scholarship houses, school supplies for children at Country Acres. INTERNATIONAL RELATIONS - World hunger. 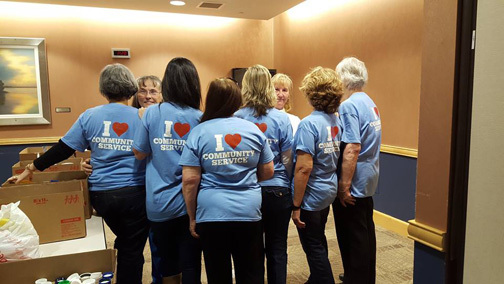 COMMUNITY SERVICES - Adopt-a-Median, spring dinners, mini grants, Community Dinners at the Harry T Moore Community Center, Liberty Lodge, Space Coast Center for Independent Living. PATRIOTISM - Avenue of Flags, classroom Flags and posters, Veterans Memorial Park. SAFETY AND SECURITY - Brain Power Walk to promote brain awareness and support Joe's Club Day Care services in Titusville. Brain Minders program to the youth. YOUTH DIVISION - Anchor projects, scholarships, meetings, conventions. Since 1962, the Pilot Scholarship House Foundation (PSHF) of the Florida District of Pilot International has made it possible for hundreds of female students to attend Florida State University in Tallahassee, the University of Florida in Gainesville and Florida Gulf Coast University in Ft. Myers. The Scholarship Houses are home to the 17 to 23 female students who live together under the same roof while attending college. Management of the house is by the students themselves. The budgeted cost of food and utilities for the semester is shared among the residents, with an average house bill per student of less than $1000. Each house is supervised by a head resident that is a graduate student or Upperclassman elected and compensated by the Southern Scholarship Foundation. Since 1957, the Pilot Club of Titusville has supported the local community, upholding the Pilot tradition of "Friendship and Service." Pilot's service focus is to promote awareness of brain-related disorders and to improve the lives of those affected. at the LaCita Country Club, Titusville, for a Luncheon Meeting. the Program meeting the Third Wednesday of the month. PILOT CLUB OF TITUSVILLE is a member of Pilot International, a global organization celebrating ninety-seven exciting years of history-making service programs and projects. Other Brain Disorders, such as Brain Tumors, Strokes, and Aneurysms. YOU WILL take off in a new and exciting direction. YOU WILL develop new and interesting friendships. YOU WILL network with other community leaders. YOU WILL improve your leadership skills. YOU WILL be lending your support to worthwhile causes. YOU WILL KNOW THAT YOU HAVE MADE A DIFFERENCE! Friendship becomes visible through the eyes of service as Pilots bond together having FUN, sharing IDEAS, developing INSIGHT, and TURNING DREAMS INTO REALITY. Belonging to the Service Club of Choice offers membership in an organization with human compassion as its basis and fulfillment of human needs as its goal. PILOT Club of Titusville sponsors the ANCHOR CLUB of Astronaut High School in Titusville. These young high school student receive invaluable training in citizenship, leadership, and volunteerism through service to their schools and their community. PILOT Club of Titusville annually awards an academic scholarship to an outstanding Anchor Graduate for the furtherance of higher learning. * Named for the intrepid river boat pilots, "PILOT" chose its name to represent guidance and leadership. 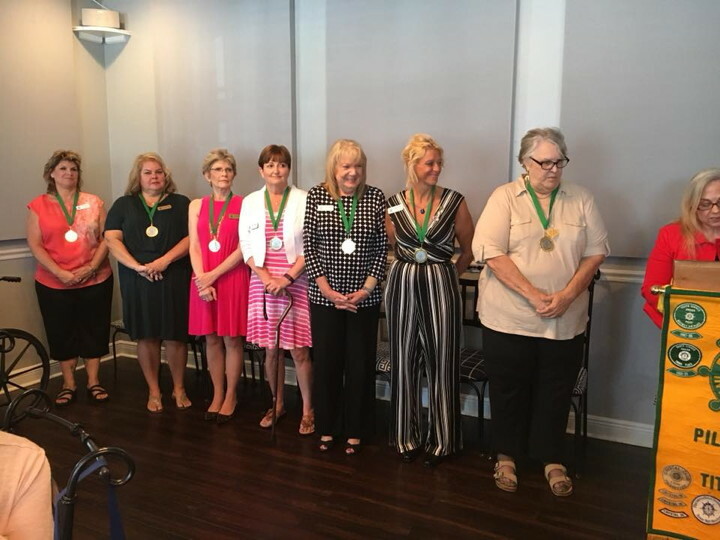 Our 2018-2019 Executive Board: Dianne Kidd Patterson, Karen Morrison Gramm, Kathleen Lowry, Carolyn Fiske, Kara Baker Richardson, Carolyn England Rigerman and Laura Wagner. 2-17-16: Pilot Club of Titusville received a $5,000.00 matching grant from Pilot International! 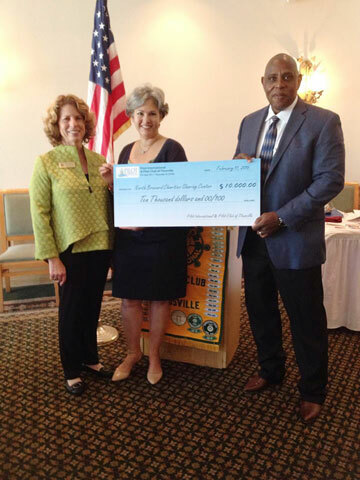 President Carol Pedersen and Pilot International Founders Fund Rep Lily Renzetti presented a $10,000.00 check to Joe Robinson, CEO of North Brevard Charities Sharing Center. These funds are designated for the Healing Home Center Program. This program is an intensive in home case management program that provides supportive services for Brevard County families with children under the age of 12. The three tangible areas targeted are eye glasses for the children, basic home necessities and school supplies that will assist in attaining a suitable environment and academic success. For more information on this program please contact the charity directly at 321-269-6555. The Trademarks displayed on the site are registered and unregistered Trademarks of PI/PIF and others. Nothing contained on the site should be construed as granting any license or right to use any Trademark displayed on the site without the written permission of PI/PIF. Any messages or content that contain defamatory, libelous, offensive, harassing, disruptive, derogatory, sexual, racial or ethnic slurs; or anything that would offend on the basis of race, gender, national origin, sexual orientation, religion, political beliefs, disability are expressly prohibited. The Pilot Club of Titusville assumes no liability or responsiblity for any errors, omissions or interaction on the site.